The shoe is comfortable to use especially when running and walking, according to some buyers. Its lightweight feature was admired by a lot of testers. Reviewers said that the flexible upper part of the shoes wraps the foot evenly. Some users noted that the New Balance 1400 v6 leaves no rubbing spots. It prevents hurtful feelings on the foot. A significant number of consumers agreed that the fit was excellent. The insole of the shoe is too thick, based on one review. Some wearers commented that the back part of the shoe lacks the capability of being reflective. A handful of wearers agreed that the New Balance 1400 v6 is a dependable shoe for daily walking and running sessions. Although some of them have problems with its thick insole and reflective details, others still lauded the shoe's perfect fit and performance. Overall, the footwear is a good option for those who are looking for a comfortable and flexible footwear. Can you train and race in the New Balance 1400 v6 road racer? Do we agree with this assessment? See the verdict below. It was certainly a light flat weighing – depending on the source, either 6.3 or 6.4 ounces. By Version 5, which I’ve run in, weighed 7.4 ounces. The new version 6 weighs 7.1 ounces. What impressed me about version 2 was the REVlite midsole that provided more than adequate protection for the feet no matter what the surface. The 1400 v6 has a 10mm drop, and retains the REVlite foam midsole, something prominently noted on the exterior side of the midsole. The outsole is made of blown rubber, which is, and feels, soft. On the road, the shoe feels like it has an 8mm drop. When I compared the 1400 v5 to v6, the new model’s outsole felt firmer. There appears to be less flexibility in the forefoot. However, when walking in version 6 the shoe feels softer, more cushioned and protective than the prior model. On the run, version 6 does feel firmer in the forefoot. While I like more flexibility in a trainer, this firmness is a positive attribute in a shoe used for fast and long runs. I very much liked the “just right fit” upper on version 5, so I feared that the remodeled upper on version 6 would be a step back. Instead, version 6 provides a slight increase in roominess – facilitated by a thin rubbery tongue which stays in place – that is welcome for feet that might swell on a long training or race day run. The heel counter on version 6 is rather firm – as it was in version 5, but the top of the counter is well padded and it is not an issue during a run. The insole supplied with the 1400 v6 – as with version 5, appears to be too thick for its intended purpose. (It’s an insole fit for a standard trainer.) I replaced it with a thin Ortholite sock liner. The 1400 v6 is protective on concrete; protective enough that the shoe feels more like a trainer than a racing flat. And, yes, there’s a nice springy bounce on asphalt. It would be a joy to run a 10k or a half-marathon in these shoes. One of the nice features about this shoe is that it allows your feet to go through the full range of motion on landing – from heel to mid-foot and onto the well-protected forefoot. 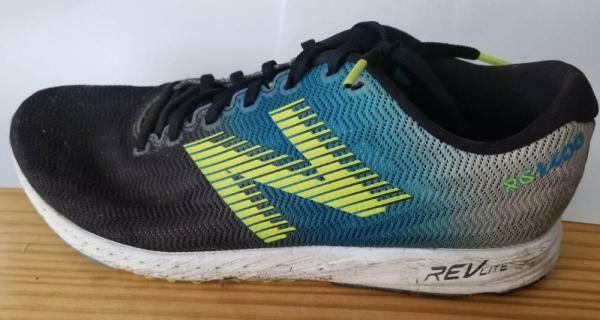 While I did not have an opportunity to run on a track in version 6, I found in my previous experience with 1400 series shoes that they are excellent for pace training runs. Lock onto a certain lap pace and the 1400s will gladly maintain that pace like a German Shepherd pup. The grip provided by the outsole also assists in piling up what I call “confidence miles.” The shoe feels so faultless on a track that one’s confidence of doing well on a race day builds with each completed lap. I usually have good experiences in mild support running shoes, and I know that New Balance makes a “hint of support” shoe in the 1500 v4. But I’ve never been tempted to try it. Why? Because the 1400 series shoes provide all the support one needs for straight ahead jogs, and these shoes do not interfere with one’s normal foot strike pattern. So why use a shoe that weighs 8.1 ounces instead of 7.1 ounces? The 1400 v6 is not a flat that will last for only 150 or 200 miles. It’s built solid enough that if you get, say, 275 or 300 miles out of your standard trainers, you’ll likely get 275 or 300 miles in the 1400 v6. At a list price of $99.00 (and sold for $10 less by certain online retailers), it’s a great value. As mentioned earlier, the 1400 v6 feels like a much more substantial shoe than it is on the road. There are racing flats that I would love to run in but they provide so much road feel that they punish the feet. A recent example is the Asics LyteRacer TS 7. I love the fit and retro finish look of this shoe, but each time I take a test run in it, my feet wind up complaining after just a few blocks. (“Take it off!”) And this shoe weighs 8.2 ounces. How can a shoe that weighs more than the 1400 v6 feel less protective? It’s a mystery to me. The 1400 series shoe has felt protective even when it weighed just slightly more than 6 ounces. That’s some kind of magic on the part of New Balance. When training for a meaningful race, it’s useful to have three pairs of shoes in the rotation: A daily trainer, the race day shoe, and a recovery shoe. For the runner loyal to New Balance, three shoes will fill the bill: the 890 v6 (9.6 ounces), the 1400 v6, and the 860 v8 (11.3 ounces). The 890 v6 trainer, like the 1400 v6, has a REVlite midsole. The 860 v8 is an excellent recovery shoe due to its well cushioned TruFuse midsole and a “barely there” medial post. The dual-density post may look somewhat intimidating to neutral runners but it is not felt while running. For those not tied to a single brand, the Adidas Adizero Boston 6 (8.8 ounces) – soon to be the 7 – works well as a durable trainer with bouncy cushioning that feels relatively soft on impact with hard surfaces. And the Mizuno Wave Sky (11.1 ounces) is a great rest and recovery shoe for tired feet and leg muscles. Yes, you can both train and race in the New Balance 1400 v6. And, yes, it’s a shoe that can be used to quickly transport and protect one’s feet on runs from a 5k to the marathon. It is a bargain shoe for its price considering that the 1400 v6 is quite durable and can serve as either a daily performance trainer or race day shoe. Or better yet, both. The 1400 v6 is New Balance's latest in the 1400 series racing flat. This shoe is a proven winner for those looking for a shoe that can be used for training runs or for race day. The 1400 v6 provides comfortable cushioning with a fast snappy ride. As you continue to read, you will come across 3 sections: Why?, Why Not?, and Conclusions. My review will focus on the reasons the shoe could work for you (Why? ), what may not work for you (Why Not? ), and some final thoughts (Conclusion). This shoe performs well at a variety of different paces and distances. This is a shoe which can perform well whether running 400m intervals or a marathon. The 1400 v6 has a 10mm drop which may seem high to the minimalist and zero drop fans. However, the 10mm drop feels quite natural to me. With a stack height of 25mm at the heel and 15mm at the toe, the 1400 v6 has plenty of ground feel. The REVlite foam is a winner for me providing plenty of cushion while remaining responsive. It's not overly cushioned but also not too minimal or harsh. The foam is also pretty durable as creases are just starting to appear in the midsole at 200 miles. New Balance has also placed a plastic shank in the midsole which gives a snappy feel to the shoe. I can't emphasize how much I enjoy running in this shoe. It feels natural at any pace or distance. It is a shoe you forget you are wearing because of how natural it feels. This upper is a no stitch mesh without overlays. This creates a light breathable upper. This is great for those hot summer days. I feel the upper has a bit more room than previous versions. The structure of the mesh provided plenty of support holding my foot in place. I had no hot spots or problem areas. Those who enjoy running without socks should enjoy the no stitch upper. The tongue is unpadded which is different from the previous version. This may be the reason for a slight roomier feel. The upper is also very durable no signs of fraying or ripping at 200 miles. I love a flexible shoe with a little bit of ground feel and the 1400 v6 is just that. Flexible and fast. My size 12 1400 v6 came in at 8.5 oz or 240gram. This is great for a shoe with good durability and cushioning. With a retail price an of under 100 US$, this shoe is a bargain. You could buy trainers and racing flats at $120 each and they still might not perform as well as the 1400 v6. This a huge disappointment. The outsole of the 1400 v6 appears very similar to v5. However, my pair is showing more wear at 200 miles than my v5 had at 300 miles. There's lots of wear at my toe off point. Also, a piece of the outsole ripped off mid-run at about mile 100. Additionally, the rubber seems to lack grip in wet conditions. I did not have this problem with the previous version. As with the previous version, the 1400 v6 is about a half size too small. I normally wear a11.5 and I needed a 12 for a comfortable fit. The New Balance 1400 v6 is one of my favorite shoes. It is versatile and comfortable no matter the distance or pace. If you are a runner who goes to different shoes for different workouts, this may be a fix-all solution for you. The newest version lacked some durability in the outsole but there are some improvements to the upper. This shoe is a winner. The 1400 V6 is a sublime shoe. There’s nothing it can’t handle and all of the miles I’ve put on it have been really fun. I think it feels a little better at speed, but it’s great at whatever you throw at it. 5k, no problem, 10k, bring it, half marathon. And if you are a speed demon, marathon--I think they’ll be just fine! Heck the 1400 was Sarah Sellers choice for that magnificent 2nd at Boston recently. The 1400V6 builds on the V5's road-racing excellence with an improved upper. The speed-friendly ride manners stay unchanged. The New Balance 1400 V6 is made especially for the comfort of the foot when running on different paved surfaces. The updated upper area utilizes the breathable mesh package. This material is light that provides an airy feeling to the foot. This affordable running shoe features the new tongue construction. The goal of which is to deliver an exceptional fit that is ready for road running activities. The New Balance 1400 v6 has improved its space. The shoe's toe box is a bit shallow but does not affect the comfort it provides to the runner. The shoe comes in regular measurements in terms of the size. The available widths are D - Medium for the men's version and B - Medium for the women's version. Its form-fitting feature ensures a hassle-free running experience. The outsole of the 1400 v6 utilizes the blown rubber. This material is described to be soft and light, yet durable enough to provide traction while running on roads, tracks, and flat trails. Its thick rubber application is expected to last from 200 to 300 miles’ lifespan. This responsive material gives added underfoot cushioning as well. The runner can feel a softer impact when running on hard surfaces. The RevLite foam is used in the midsole of the footwear. This innovative foam compound delivers a responsive and lightweight cushioning as well. This component of the shoe also provides more protection for the foot throughout the running session. The RevLite foam is also used in the New Balance 1500 v5. Additional underfoot cushioning is offered by the traditional sock liner. As a result, a more comfortable ride is experienced by the user. Even with the use of the sock liner, it does not affect the overall performance, responsiveness, and flexibility of the shoe. The Engineered Mesh is integrated into the New Balance 1400 v6. Covering the majority of the upper section, this material is updated to provide a lighter and softer coverage. The shoe uses Synthetic Overlays. These overlays are strategically-placed in the upper section to wrap the foot. Foot-wrapping is essential in providing a more secure fit. The NB-J is another notable feature of the shoe. New Balance added this racing-specific last to provide a higher performance running.